In case you're wondering, the message there is not that rattle snakes should stay out of our house (although they should. Absolutely. 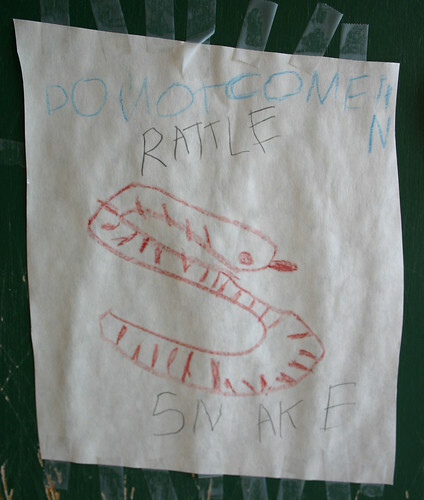 ), it's that Daddy should stay out so that he is not repeatedly bitten by rattle snakes. Not that we have rattle snakes around here. Just Gopher Snakes. Nonetheless, Mark acts appropriately horrified and screams like a little girl to show that he is intimidated. Then he stands around outside while Lily's screeches with glee and then throws a hastily drawn picture at him: yes, that's the surprise. This is one of the many things that will eventually win him that father of the year award he so covets. I'm thinking that rattle snake is holding a fork. Or a spatula. Or maybe an open book? Regardless, I'm going to have to buy more tape.